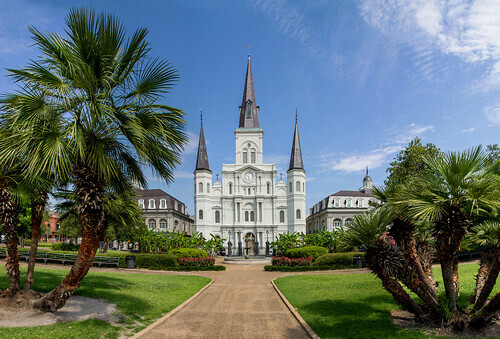 The city of New Orleans, situated in the southeastern corner of Louisiana, is a great holiday destination for those looking for a bit of cultural immersion. The city is named after the French Duke of Orleans, and to this day it maintains a touch of European panache. New Orleans is a great destination for fans of good food, music, and you’ll find plenty of cultural activities. Don’t forget to book a fantastic New Orleans hotel near your ideal itinerary activities, too. With its ample French influence and a variety of other cultures, New Orleans offers a true melting pot of cuisines. Popular dishes range from sumptuous chargrilled oysters to hearty red beans and rice to the famous beignet, a light, doughy offering that’s topped with powdered sugar and provides the perfect mid-morning treat. African, Spanish, Italian, French, Native American, Chinese, and Cajun restaurants throughout the city serve such dishes, so whatever your culinary preferences might be, you’ll feel like you’ve landed in foodie heaven when you arrive in New Orleans. Along with its diverse restaurant scene, New Orleans is also famous for its great music. Often considered the birthplace of jazz, New Orleans is home to a number of soulful bars where you can enjoy music from jazz greats dating back to Louis Armstrong and Ellis Marsallis and right up to modern-day interpretations from the likes of Harry Connick, Jr. Fans of other genres will also enjoy themselves at venues also dedicated to blues music, rock and roll, and hip hop. Of course, you can listen to the city’s great music outside of the bars, too. New Orleans is also home to a number of world-famous festivals including the Jazz and Heritage Festival, Voodoo Fest, Essence Music Festival, and Mardi Gras, which is surely the most unique way of ushering in the Feast of the Epiphany. Visitors who want to break away from the food and music scene for a short while can explore a number of other exciting options in New Orleans. Sports fans have an almost unlimited selection of options and teams to support ranging, from American Football (New Orleans Saints), basketball (New Orleans Pelicans), baseball (New Orleans Zephyrs), women’s football (New Orleans Blaze), to local athletics events and golf tournaments. Other non-sporting cultural outings include visits to cathedrals such as the beautiful St. Louis cathedral. You can also wander through the Sydney and Walda Besthoff Sculpture Garden or take a gentle stroll around one of New Orleans’ city parks, where you could even partake in some horseback riding. As you can see, New Orleans is a fantastic holiday destination for lovers of food, music, or a range of other cultural treats. With so many great restaurants, hotels, bars, and music venues to discover here, what are you waiting for? Book that well-deserved vacation to New Orleans right away. You certainly won’t regret it!